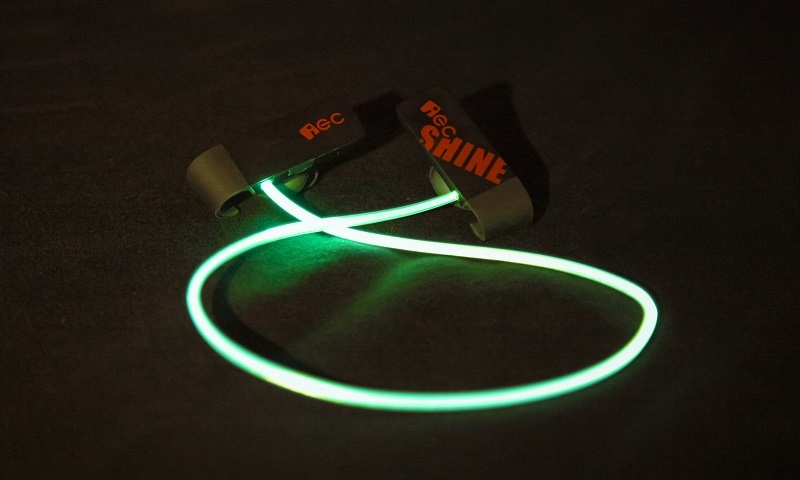 The neckband can glow in 24 different colors, with the music that is playing or with the movements of the user. Or it can change colors over time. After trying them out I can say it looks really awesome. The light is bright enough to be seen from some distance, but not so bright as to be distracting. 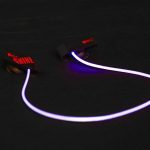 Besides looking cool, it can also be really useful for people who go for runs in the dark, so they are more easily seen. When glowing with the movements of the user they essentially blink with your steps, using the built in G-sensor. 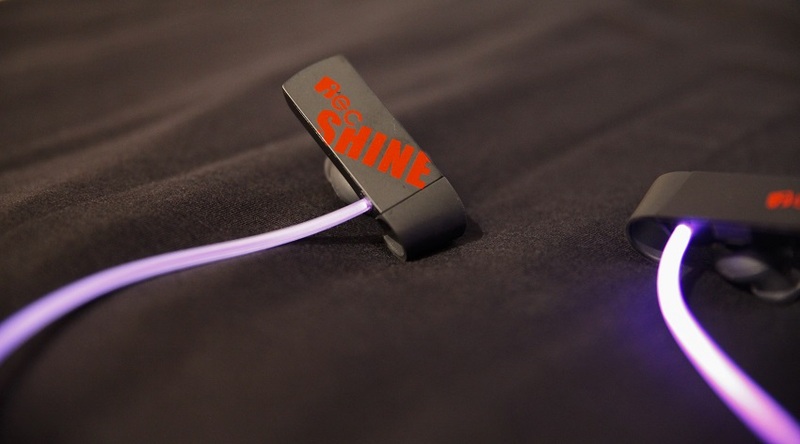 For motion detection based glowing, the headset uses a G-sensor, 3-axis, counting steps, frequency, speed and time. 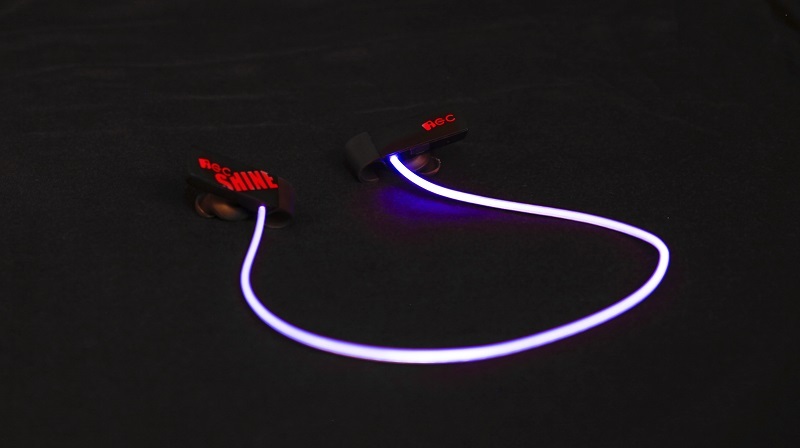 If you receive a phone call while using them the lights will stop and you can use the earbuds as a bluetooth headset, with built in microphone. At release you will also be able to control the lighting effects through an iPhone or Android app. They also look very nice with the matt black finish. But they will also be available in white, orange and green. It has a battery life of 7 hours, during continuous use. 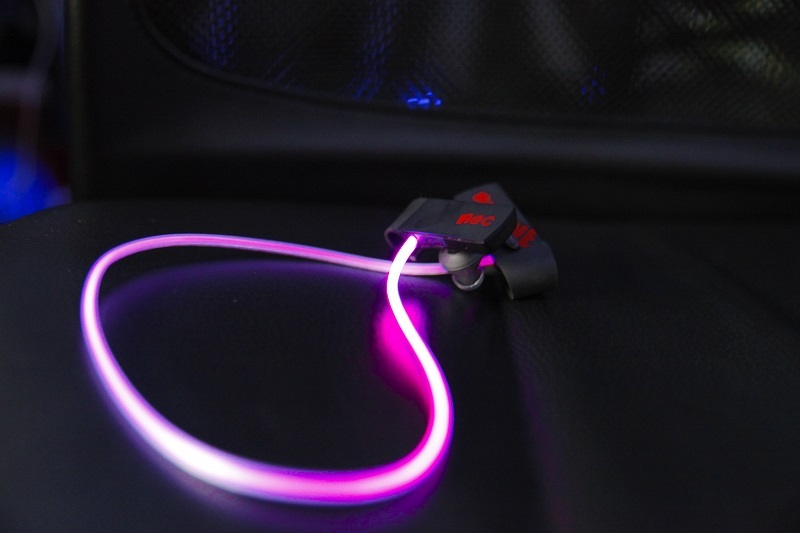 They are charged through a micro usb cable, charging time is 1.5 hours. This part really impressed me, they have a quite mighty sound and are fairly small, yet they last so long. In fact I have only had to charge them once since I started using them about a week ago. They have four buttons, power, volume up/down, and one to control the light mode. However you can also tap on the side of them to play/pause, which is pretty convenient. As for my experience, I’m quite satisfied with them. 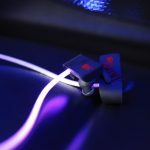 They have a sort of rubber hook that goes over your ear, that actually works really well without becoming uncomfortable. Usually I don’t like sports earbuds at all, they will usually stay on, but become really uncomfortable after a while. 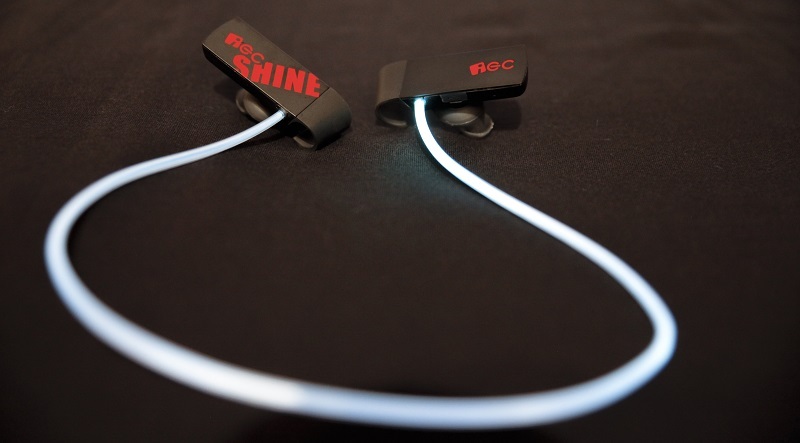 The Shine earbuds were quite comfortable to use even for extended periods. They’re not too heavy either, at only 17 grams. The sound quality however is to me the most important part. And I have nothing to complain about, they perform equally well (or in some cases better) than other high-end earbuds I have tested. All the desired frequencies are there, and the bass is deep and all in all very good. 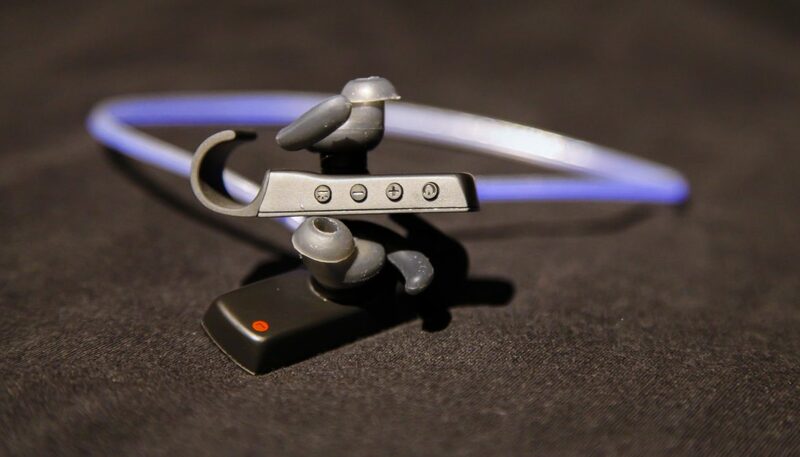 For being sports headphones they have really good sound quality. I did however notice a slight continuous beeping tone from one of the earbuds when I tried them on in a quiet room without music on. This might have just been the case with the pair I tried, and I’m presuming it will be fixed before they are released. When used during regular circumstances I did not notice the sound. All in all I’m very happy with them, and I recommend you get a pair while you can! 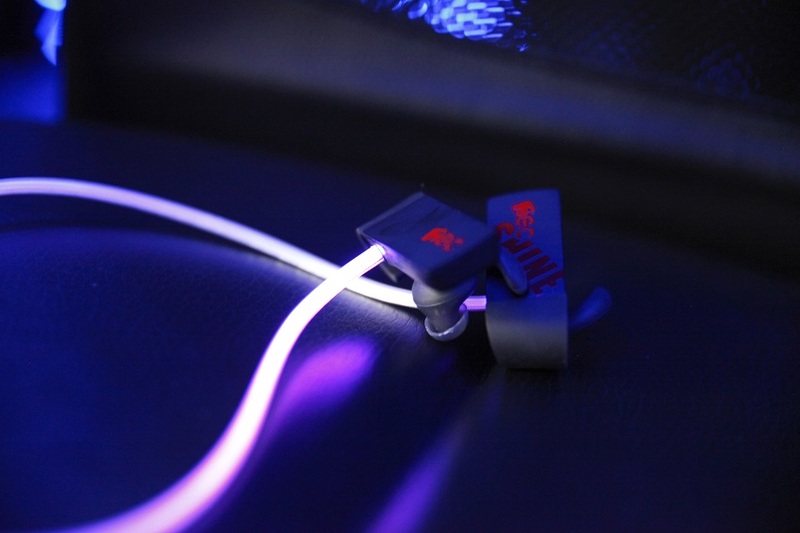 They are currently up for funding on Kickstarter, you can get a pair by donating $59 or more. 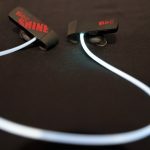 If you donate $79 or more you will also get accessories through their partners, including LED light-up hoodies and sneakers. But you’ll need to hurry up since the Kickstarter is over in 9 days. You can find their project page here. Thanks to IEC for being so kind and letting me try out one of their early version of Shine!